Building a fire-resistant home above and beyond California’s wildfire code is a great first step toward extra peace of mind. Also, maintaining appropriate, well-trimmed landscaping — called “defensible space” — around that home is another proactive move homeowners can make to buffer houses and outbuildings, plus it helps firefighters do their jobs by providing safe access to and around properties. 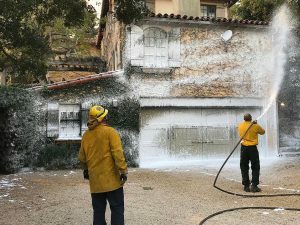 And here in Santa Barbara and Montecito, many homeowners, especially those in the rugged foothills, opt for yet another layer of protection — private fire-protection services. For nearly a decade, insurance firm AIG has been collaborating with Montecito Fire Protection District to pretreat high-traffic roadside areas, such as trailheads and turnouts, with a nontoxic, biodegradable fire-retardant spray called Phos-Chek. The company is one of many that also provide specialized protection of private property, responding to wind-driven events, such as the Thomas Fire, on a variety of levels. During a fire, for example, private teams stay abreast of the blaze by tuning into radio chatter and attending daily briefings lead by incident commanders; then they report back to homeowners. When situations get critical, it’s not uncommon to find private crews carefully protecting homes alongside publicly funded firefighting agencies. AIG alone has about 75 clients in the Montecito district, according to Chief Chip Hickman. Other outfits spotted recently during the peak of Thomas Fire’s move through Santa Barbara’s front country included Sacramento-based Mt. Adams Wildfire, whose workers coated structures with white foam (pictured above) as safeguard against drifting embers. Goleta-based Consumer Fire Products was also in the area, as was Wildfire Defense Systems, Capstone, and Firestorm. As long as private teams are properly trained, says Santa Barbara County Fire Department Captain Dave Zaniboni, extra boots on the ground can be helpful.